If you are planning on heading to Paris anytime soon, or if you just want to read about me gushing about the beautiful city – read on! As there are so many great things I unfortunately haven’t done everything (yet), so here are some of my top favourite things to do I have done myself – that I can fully recommend. One of the most iconic structures in the world – the Eiffel Tower is of course number one! Going up it is an experience not to be missed. I even did it a second time when I visited again, even though it had been less than a year since I had last gone up. It’s so enjoyable – I’ll probably do it every time! Tip: take the stairs and walk up – it’s cheaper than getting the lift (only 5 Euros) and it’s not as hard as it looks. Think of all the impending bread, cheese and wine you are burning off! You can take the lift down for free so you only have to take the stairs one way if you wish to. Quite a recent feature on the first floor: if you’re brave enough – stand on the transparent floor made of glass and see the hundreds of tiny people standing below you. I’m not afraid of heights, but it’s still pretty nerve-racking! Being the biggest museum in the world and a historic monument in Paris – the Louvre is one not to be missed! Even if you have no interest in art or history, it is absolutely one of those astounding places that is honestly worth visiting. Tip: there is more than one entrance, take the second, lesser-known one to beat the queues! Here’s a link to an in-depth description of where to find it: Secret Louvre Entrance. It has countless (okay I looked it up – over 35,000) objects, sculptures and paintings on display ranging from Ancient Egyptian, Greek, Roman to Medieval, Renaissance, World Wars, French Revolution etc. It is a completely overwhelming (because there’s so much to see!) but totally captivating experience. Hire a headset and there’s no need to take a tour – it will guide you through each room. As most people are – I was pretty disappointed by the Mona Lisa. It’s so small and well, boring compared to all of the other grand and magnificent works of art surrounding it. Not to mention so crowded in that room. So please don’t be one of those people that only go to the Louvre for a photo with the Mona Lisa and then leave – it’s the most underwhelming painting in there! My favourite things to see were: Michelangelo’s Dying Slave (1513), the Victory of Samothrace (190 BC), Psyche Revived by Cupid’s Kiss (1787), Four Seasons (1600), the Great Spinx of Tanis (2600 BC), the Napoleon the Third Apartments (fully decorated rooms), the Borghese Gladiator (100 BC) and many others. The cafes are a bit pricey so if you’re watching your budget you can bring in your own lunch and drinks. The Louvre is open every day of the week except Tuesdays. Not for everyone – especially the claustrophobic, but I particularly liked visiting the Catacombs because I like skulls! Yes, it’s a bit creepy that they are real skulls and bones, but it’s still a pretty cool experience. 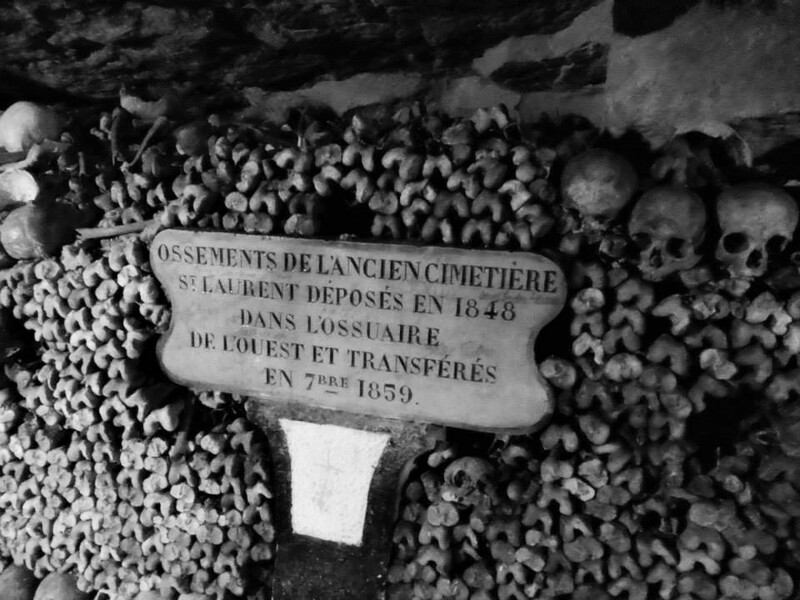 The basic story is in the 1700’s they ran out of room in the cemeteries – they were overflowing, so the underground burial site began. The skulls and bones were removed from the skeletons and arranged carefully and some even in an artistic way, which created the walls that we see today. There is plenty of information as you walk along so it’s an interesting history lesson as well. Another stunning monument of Paris, the Arc de Triomphe is a must-see and surprisingly big! It’s so large that in 1919 during the victory parade ending World War 1, Charles Godefroy famously flew his biplane through the arch which was captured on newsreel. 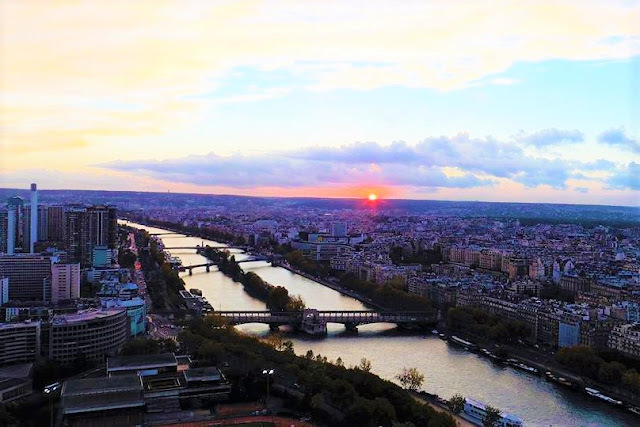 You can pay to get the lift to the top for magnificent views of Paris – especially the Eiffel Tower standing directly before it! There is even a small museum located at the top. While you’re in Montmartre the area offers many great dining options as well as being home to the famous cabaret shows. Well-known for the famous Can-Can dance, a cabaret show might seem like a tourist trap, but it’s an incredible spectacle and well worth the money in my opinion. There are many different shows to choose from – I just took the photo of the Moulin Rouge, but actually went to a cabaret show just down the road from it which was half the price – and it was still amazing! The shows are high-energy, entertaining and features wonderfully talented dancers. There we have my top recommended things to do in Paris. Unfortunately, I haven’t yet been to the Palace of Versailles, and I would say that is definitely another top thing to do, I just haven’t had the chance to visit yet. I also wouldn’t say no to Disneyland Paris! Definitely next time – as mentioned, there is so much to do, so I have no doubt that you will have a great time, whatever you choose to do yourself. 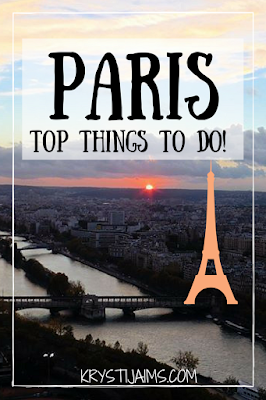 Don’t forget to check out my other Paris guide – P A R I S | Top Travel Tips!.